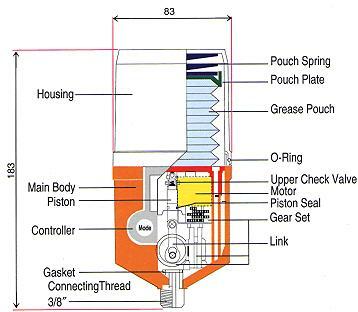 PULSARLUBE M, a single-point automatic grease dispenser is designed to ensure reliable lubrication and cut lubrication costs with an advanced electric control mechanism. It consists of a vertical feed pump, motor/gear set, and microprocessor control system, allowing operating pressure up to 20kg-f/cm2 (280psi). 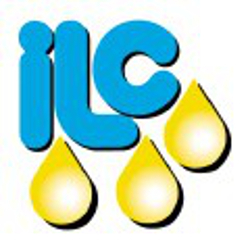 A carefully selected full range of high performance lubricants enables accurate selection of grease : i.e. 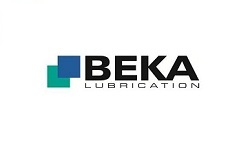 mineral based multipurpose, heavy duty, high speed, fully synthetic food grade(USDA H1), high temperature and cold temperature lubricants. 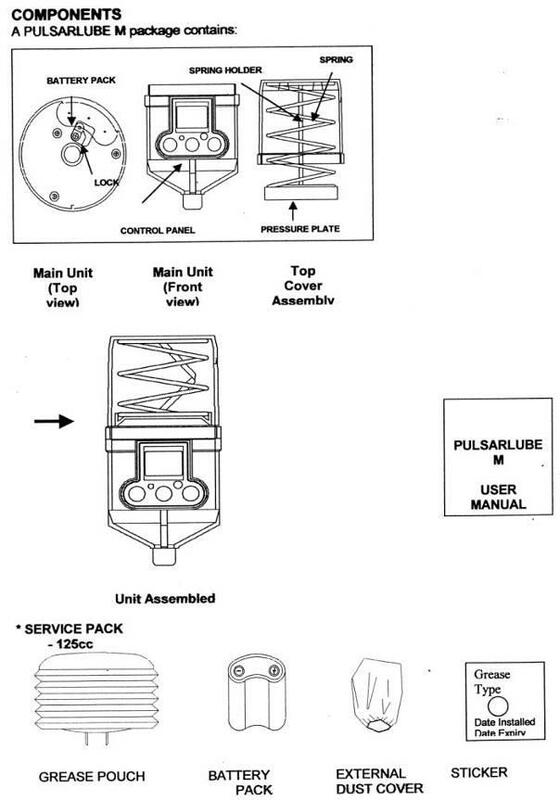 PULSARLUBE M optional dispensing rates from 1 to 12 months in a single unit. 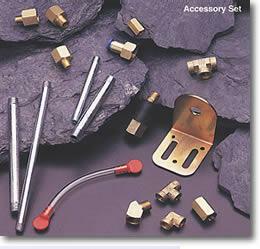 Temperature range can be varied by either a relative humidity or heat radiation in the application. High performance NLGI 2EP grease for heavy-duty applications. Dark gray colored (contains MoS2). 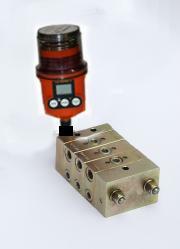 High performance NLGI 1 grease specially designed for high-speed applications (above 3,000 rpm). USDA H1 rated NLGI 1 High performance Aluminum Complex grease for food applications. Fully synthetic high performance NLGI 2 grease for extreme temperature applications. Yellowish colored PL1 for applications where use of dark color grease is not desirable. High performance EP grease specially designed for cold temperature applications (below 0ºC/32ºF). Insert the PULSARLUBE M BATTERY PACK into the battery compartment of main unit. 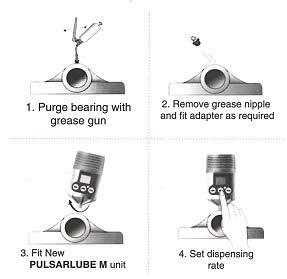 Unscrew the cap of PULSARLUBE M GREASE POUCH. Position the pouch outlet onto the pump suction inlet. Fit the Top cover to main unit. Be careful! It is high-tension spring-loaded and needs caution. Depress POWER button first and then depress 125/250cc button within next 2 seconds. Unit will continuously operate unless POWER button is depressed. To deactivate FUNCTION TEST MODE, depress POWER button again. Unit will stop testing within less than 2 seconds. For any malfunction or trouble encountered, please refer to troubleshooting guideline. 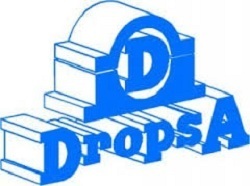 Depress MODE button to set dispensing rate. 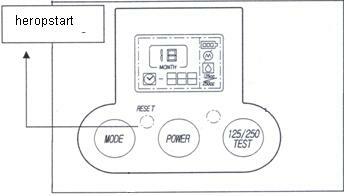 Each time MODE button is depressed; the dispensing rate changes from 1,2,3,6, and 12 month.